70207 CHI Cragger is a Legends of Chima set released in 2014. It is not available in North America. This is a description taken from LEGO.com. Please do not modify it. (visit this item's product page) CHI-up and build the ultimate Cragger! Put the bite on rival tribes with CHI Cragger! 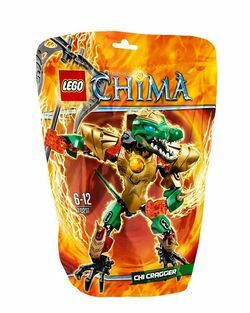 This buildable CHI-powered figure is the ultimate Croc tribe warrior, featuring snapping jaws, golden armor and a cool playable CHI function. Adjust his flexible limbs to create awesome battle poses and attack with the buildable CHI axe. When CRAGGER is on the march, opposing tribes had better run for cover! Move CHI Cragger’s super-flexible limbs for ferocious battle poses! Facts about "70207 CHI Cragger"